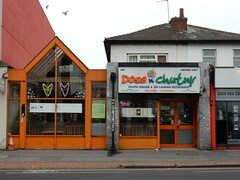 Dosa N Chutny was a South Indian restaurant on London Road in Croydon. It has now closed. As of December 2018, there's a sign outside stating that a "new Indian restaurant" will be opening there soon. South Indian restaurant on London Road in Croydon. They have another branch in Tooting. It's fairly casual in ambience, though a touch of style is added by the marble-effect tabletops, matched by similar tiles on floor and walls. Mirrored pillars break up the space somewhat, and additional light is provided by two peaked skylights. Chairs are upright and wooden, and metal jugs of tap water sit ready on the tables. Seating is available for around 60 in the main side, and a few more on the other. Kake visited on a Thursday afternoon in January 2018. Unsurprisingly, it was almost empty when I arrived a little before 3:30pm, with just one other customer. No music was playing. Egg dosa (£4.50) photo arrived quickly. It was crisp around the edges and softer in the centre, and the sourness of the dosa was very subtle. The egg was spread thinly, but its flavour was evident. Chutnies on the side were competent albeit undistinguished, and the sambar was fine but a little salty. Masala tea (£2.50) took quite a long time to come, and tasted primarily of cardamom, with little or no other spices apparent. It arrived unsweetened, with sugar provided on the side. Accessibility: No steps to get in, and there's a shallow ramp up to the main seating area. No steps to toilets either. Last visited by Kake, January 2018. Last edited 2018-12-06 21:15:20 (version 2; diff). List all versions. Page last edited 2018-12-06 21:15:20 (version 2).